Entertainment Desk :The Athena Gallery of Fine Arts was organized a solo painting exhibition of internationally reputed Artist Kalidas Karmakar titled ALLUVIAL REALIZATION. The opening ceremony for this long-awaited event was take place 4th December 2015 at 6.00 PM at Athena Gallery of Fine Arts, Dhaka. 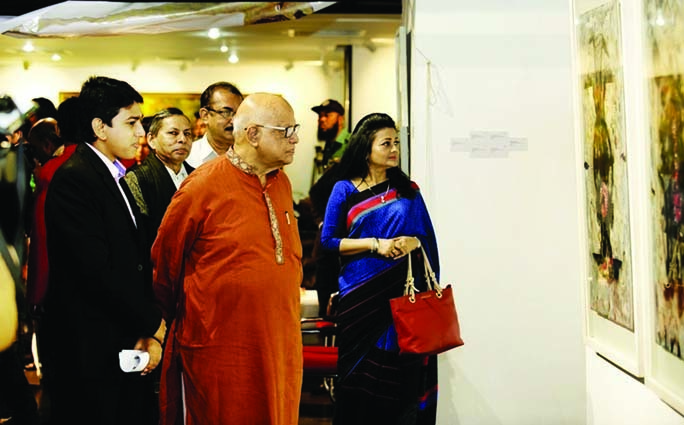 Mr. Abul Mal Abdul Muhit, MP, Finance Minister of Bangladesh Government inaugurated the exhibition as Chief Guest. Tasmima Hossain, Acting Editor of Daily Ittefaq & Editor of Anannya, Renowned Artist and Media Personnel Mustafa Manwar, Ambidextrous Writer Syed Shamsul Haque will be present as our Special Guests.The exhibition will remain open from December 4th to 22nd December 2015. Daily from 10 AM to 8 PM.Artist Kalidas Karmakar (born 10 January, 1946) made his mark as an artist with a difference in his first ever-major solo exhibition held at Bangladesh Shilpakala Academy Gallery in August 1976. He has distinguished himself as an experimentalist then and remains one even today. He impressed all of us with his skill in Drawing, his adventures with the use of unorthodox materials and media, as well as his philosophical attitude to art. He is an accomplished graphic artist, especially in etching and mixed media technique. He specializes in the French multi-colored etching (Viscosity process) and work with World famous artist S.W. Hayter who invented the Viscosity technique in 1930 at Atelier-17 Paris. Kalidas is such a versatile artist with no boundaries. He received Sultan Padak in 2015. Kalidas is one of the most internationally acclaimed artists of Bangladesh. He restlessly travelling from Poland to Paris, from Brazil to Beijing, from Turkey to Tokyo, is returning predictably on each occasion to his homeland, to pour out his passion. Kalidas Karmakar is indeed a very significant name in the World of modern art of Bangladesh. At 70 he is still very youthful and exuberant creative person, an artist Par Excellence.